The air is crisp and cool, and it's time to break out the cozy sweaters and snuggly scarves! Take a java to the farmers market to pick up some of these fall beauties, then cuddle up at home with some delicious, nutritious fall favorites. Winter Squash - winter squash is the primary food source of alpha-carotene and beta-carotene in the entire diet! For lutein, zeaxanthin, and beta-cryptoxanthin (three other health-supportive carotenoids) winter squash also comes out among the top three food sources in several studies. Carb counting? Not to fear! Many of the carbs in winter starch come from polysaccharides found in the cell walls. These polysaccharides include pectins—specially structured polysaccharides that in winter squash often include special chains of D-galacturonic acid called homogalacturonan. An increasing number of animal studies now show that these starch-related components in winter squash have antioxidant, anti-inflammatory, as well as anti-diabetic and insulin-regulating properties. Boom! These healthy carbs are acceptable. Pumpkin - pumpkin really packs a nutritional wallop! The actual whole food I mean, NOT the spiced espresso beverage... Pumpkin contains loads of beta-carotene and vitamin A, which are great for skin and eye health. It also contains loads of potassium and fiber to keep you regular, and feeling satiated, keeping the pounds away. It's also got a fair dose of B-vitamins to keep your energy up and metabolism heated up. Bake into bread (if you're into that sorta thing), make a cinnamon/nutmeg spiced pumpkin puree, or throw into an antioxidant loaded protein smoothie. Sweet Potato - these little cuties are loaded with vitamin A, beta-carotene, manganese, vitamin C and a healthy dose of B6. Vitamin B6 is crucial in breaking down a substance called homocysteine, which contributes to hardening of the arteries and blood vessels. Vitamin B6 helps keep vessel walls flexible and healthy, allowing blood to flow more freely. B6 is also an important factor for clearance of estrogens in the liver, and low levels of B6 are associated with PMS, migraine and depression. Oven roasted sweet potato fries with a touch of cayenne and cinnamon. Yes, please. Pumpkin Seeds - pumpkin seeds could easily have their very own post here! But, that's no fun! These little powerhouses are loaded with magnesium, copper, manganese and zinc. Zinc plays a crucial role in immunity, skin health, sleep, mood and male sexual function. A single ounce of pumpkin seeds can contain up to 2mg of zinc per serving! Pumpkin seeds also offer an important source of plant based omega-3s. Keep these little treasures that your jack-o-lanterns donate and roast them up with a pinch of salt for a waste free, and delicious, holiday treat. Flax Seeds - flax seeds are rich in omega-3 fatty acids, dietary fiber, and special plant compounds called lignans. Recent studies show flaxseeds may help reduce belly fat and lower your risk of heart disease, cancer, stroke, and diabetes. It doesn't hurt that they taste pretty darned good too! You really need to fresh grind them to get the full omega 3 benefits, or use it as a cold oil to top salads, smoothies or oatmeal. Don't buy pre-ground, as this allows the oils in the seeds to oxidize before you use them, and you miss out on the healthy benefits. Pears - pears are one of the highest fiber fruits out there. Filling up on fiber keeps you regular, prevents bloat, and also helps prevent against colon cancer. Getting your fill of fiber from fruit is also linked to a reduced risk of diabetes, heart disease and breast cancer. Pears also contain a fair amount of vitamins C, K, B2, B3, and B6,calcium, magnesium, potassium, copper, boron, and manganese. Holy multi-function fruit! Pear skin also contains quercetin, which has been shown to help prevent cancer, arterial damage and may protect against Alzheimer's disease, so be sure to leave the skin on! Pomegranates - preaching to the choir here I'm sure! Pomegranates are a well known source of polyphenol antioxidants to keep your immune system running at top notch and keeping you younger, longer. Pomegranates have also been shown to have a powerful anti-inflammatory effect and may help prevent joint damage in osteoarthritis. 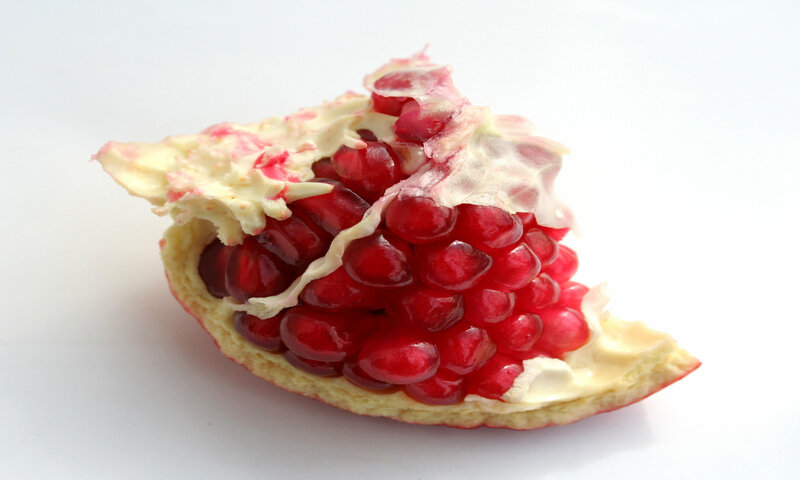 As if that's not enough, the compounds in pomegranates may help reduce the accumulation of LDL plaques in your arteries. Did I mention they're gorgeous!? Stay healthy, stay happy and have a fabulous fall!